Keep kids indoors and teach them to stay away from rivers and waterways during the rains. I'm looking out my living room window as rain continues to pummel the Western half of Japan for the third day in a row. This isn't a normal summer rain storm in Japan. This is a massive storm, dumping up to 7 centimeters per hour of rain at its peak, and continuing for days. Rivers have turned violent, landslides are being triggered all over, and hundreds of thousands of people are being evacuated all over, from Kyoto to Fukuoka. Two people are confirmed dead and 5 are still missing. The only priority at a time like this is to survive, which means staying informed, making good decisions, and communicating. In this regard, Kobe City is the Gold Standard of disaster management. If you're an expat here with a Japanese iPhone, then you received the same alert I did on Thursday morning. Everyone's phone went off with a blaring alarm and a warning about the rains, advising people to take safety precautions. 【21:00 July 6】The record heavy rainfall has been continued in Kobe and there is high risk of landslides and flood. Unless urgent and absolute necessary, please stay at home. If you cannot help but leave home, please keep yourself away from hazard areas including swollen rivers. Another resource you should be aware of is Kobe's live updated hazard map. Right now one of the greatest risks is sediment disasters, landslides triggered from the massive rains. The other major danger is simply getting stuck without safety. 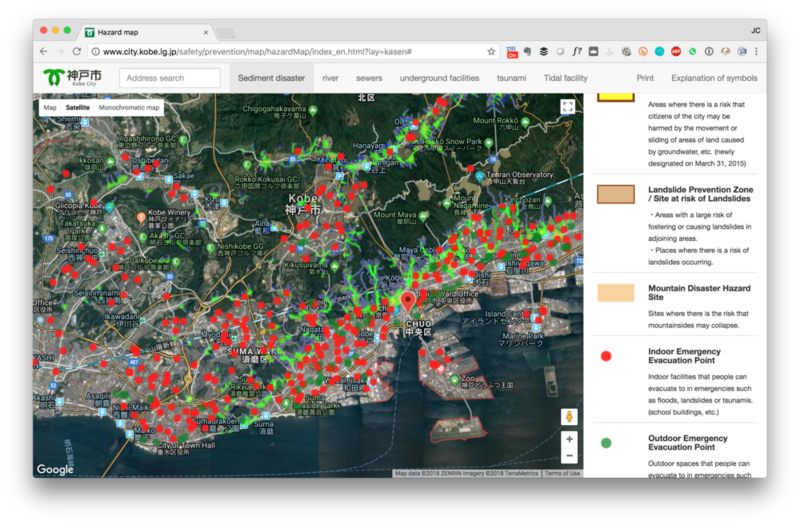 The Kobe City hazard map provides a real-time view of all possible risks, and also identifies indoor and outdoor emergency evacuation points. The hazard map is available in Japanese and English, as well as Chinese and Korean. If I missed any critical resources you know of, please let me know via twitter @livinginkobe or on Instagram so we can update this post. Originally from Southern California, I live in Kobe Japan with my wife and two boys. What's it like living in Japan? Jan 22 I bought a bike!